HomeKeratoconus – what is a corneal graft or transplant? Keratoconus – what is a corneal graft or transplant? One of the scariest things about having keratoconus (KC) is being told that ‘you might need a corneal graft’……..WHAT?! This is an operation in which part of your cornea is removed and replaced with a similar piece of cornea from a donor eye. The cornea is like a window over your eye, in a normal keratoconus free eye the cornea is transparent. Light is able to enter the eye through the clear cornea, pass through the clear lens to focus on the retina at the back of the eye.If yours is damaged or in the case of keratoconus thinned and possibly scarred- that ‘window’ cannot work so well, thus your vision is impaired. Whether you have good eyesight or not- if you cannot see through your cornea, then you have a problem. Let’s start with a few simple facts. Not quite so scary eh? At the point where you can no longer correct your eyesight with contact lens or glasses, thanks to a steep and thinning cornea in the case of keratoconus, then a corneal graft or transplant is in order to replace your cornea with a healthy one from a donor eye. The first successful corneal transplant took place in 1905, when Eduard Konrad Zirm, MD, and started a long line of corneal transplantation, research and techniques. During its existence, Zirm’s eye bank, located in a rural area of Austria, treated over 47,000 patients. Later in 1914, Anton Elschnig, MD, also of Austria, performed the second successful corneal transplant and over the twenty years he would make various contributions to the study of peri-operative infection and pre-operative preparation. The 1920’s and 1930’s would see Russian ophthalmologist Vladimir Filatov refining lamellar keratoplasty and developing a new method for full thickness keratoplasty. He also used a donor cornea from a cadaver for a penetrating keratoplasty in the 1930s.tained his eyesight for the rest of his life and was back working on his farm within three months. Grafts back in those days really were grim! Poor Alois who received this first cornea transplant in 1905 was given no antibiotics for possible infections, no steroid drugs to stop his brain and body rejecting the tissue – and he had to suffer his eyelids being sewn shut for 10 days before he knew if the procedure had worked. Nothing as gruesome as this happens today, over 100 years later. Zirm showed undeniable skill and insight, but luck, as with many advances in medicine and science, must also have played some part in this remarkable achievement that paved the way for the successful treatment of many thousands of patients around the world with corneal diseases such as keratoconus. The first UK cornea transplant did not take place until 1930, perhaps because of a view that Dr Zirm’s success might be hard to replicate. Since then, thousands of people across the world have benefited from cornea transplants – including up to 2,500 every year in the UK alone. This operation is normally performed under a general anaesthetic although if the patient’s general health is poor it can be performed using a local anaesthetic. Blood and other tests are sometimes performed to ensure patients are in good health for the general anaesthetic. The operation usually takes between 30 to 60 minutes. It involves the eye surgeon removing a circular portion from the centre of the cornea and replacing it with a similar sized circular area from the donor’s cornea, which is then stitched into place with very fine stitches (also called sutures). The surgery is performed with the help of a microscope. 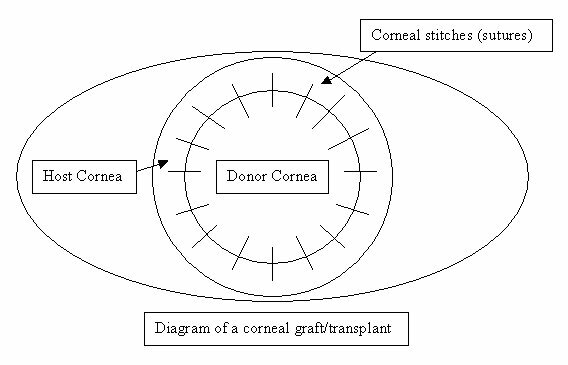 In some cases other procedures such as cataract extractions and glaucoma operations may be done in combination with corneal transplant. The diseased part of the cornea that has been removed is occasionally sent to laboratory for examination under a microscope. Partial cornea transplantation (‘deep anterior lamellar keratoplasty’) replacing or reshaping the outer cornea, also known as DALK. A lamellar graft replaces part, rather than all, of the thickness of the cornea. It can be used instead of a penetrating graft if the deeper layers of the cornea are healthy. While the general experience of a patient undergoing a lamellar graft will be similar to that of a patient having a penetrating graft, there are some slight differences. The deepest layer of the cornea (the endothelium) is not replaced. So rejection is much less likely to occur and less steroid drops are needed. The eye retains some structural strength and may be a little less vulnerable to injury. It is possible that stitch removal may safely be done a little sooner after the operation. But only a minority of patients needing corneal grafts are suitable for a lamellar operation. The operation itself takes longer and is technically more demanding due to the need to split the cornea into layers. Sometimes it is impossible to complete the operation as a lamellar one and the surgeon must convert it into a penetrating graft during the op. Femto DALK technique uses a precise laser to remove only the abnormal corneal tissue whilst conserving the patient’s own endothelial cells (so there’s less risk of rejection). The centre of the patient’s own cornea is completely removed and replaced by a transplant which is sutured (stitched) into place. A trephine (a circular cutting device) is used by the surgeon to cut the donor cornea, which removes a circular disc of cornea. A second trephine is then used to remove a similar sized portion of the patient’s cornea. The donor tissue is then sewn in place with sutures. Antibiotic eyedrops placed, the eye is patched, and the patient is taken to a recovery area while the effects of the anesthesia wear off. The patient typically goes home following this and sees the doctor the following day for the first post operative appointment. New ways to do corneal transplants are developing with bladeless techniques for minimum invasion growing in popularity and expertise by many surgeons. This is usually done under a full (general) anaesthetic although it may be possible to use local anaesthetic. It takes between one and two hours. During the operation the surgeon removes a circular piece of your cornea and replaces it with a similarly sized piece of the donor’s cornea, which is stitched into place. In some cases other procedures, such as cataract extraction, may be done in combination with the corneal graft. These may increase the length of the operation. You will awake up with some soreness in the eye and a shield taped over it. Your eye will not be bandaged up. You will be allowed up and about after the operation. You may be allowed home the same day or, if not, one or two days later. 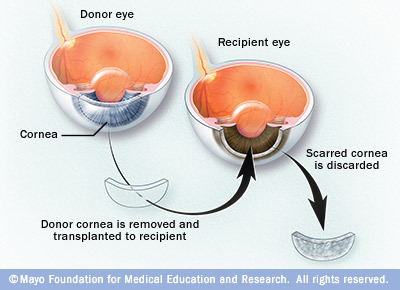 Either the full cornea or part of the cornea is removed and replaced with the donated cornea. If PK or DALK are being performed, the new cornea is then held in place with stitches, which stay in for at least 12 months and are gradually removed. DSEK doesn’t require much stitching. The very tiny stitches or sutures that are put into the cornea hold the graft in place but also affect its shape and therefore the way the eye focuses. They are not dissolving sutures and will eventually need to be removed. Two main patterns of suturing are used – interrupted (or individual) suturing and continuous. Some surgeons use both methods combined. Some people find the stitches are a bit tight and can have them adjusted. Others have a rogue stitch that can become loose or break and this too can easily be dealt with. Pain after a corneal graft is seldom severe and can be expected to settle quite quickly, although the eye can be irritable for a number of days. The improvement in vision, however, is often rather slow. This is because the cornea takes a long time to heal, and as it does so, shape changes in the cornea lead to changes in the way it focuses light. It is unlikely that your vision will be “stable”, i.e. worth prescribing new glasses or contact lenses, for at least six months after the operation, and in some people it can take a year or more. The eye is typically not padded but patients are asked to wear a plastic shield over the eye at night for the first four weeks following surgery. Vision is typically blurred for the first few weeks and months after surgery as the new cornea heals and settles slowly. However, an improvement in vision is often noted even during the first few days/weeks. Typically, vision is not stable during the first six months following surgery so glasses or contact lens are not usually prescribed until after this timewhen your doctor is happy that everything has healed well. 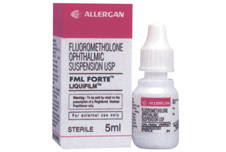 It is vital after the surgery to use the eye drops you are prescribed exactly as instructed to do. They should not be stopped without consulting your optom. At first these drops will have to be used quite intensively as much as every hour or every two hours, but gradually over the next weeks/months, this will reduce. The drops used following surgery are usually of two types- antibiotics for preventing infection and are usually only used for about 2 weeks; and steroids, which are used to reduce inflammation and the risk of corneal transplant rejection and are normally prescribed for several months. Some patoents have to take these steroid eyes drops for life if the risk of rejection is high. It is important to attend all out-patient consultations as the steroids can cause raised pressure within the eye which can permanently damage the nerve at the back of the eye and cause loss of sight. So over time your dosage and type of drop may be changed by your optom. During the first weeks after surgery the cornea is vulnerable to trauma and care should be taken to avoid strenuous exercise, swimming or heavy lifting. A plastic protective shield should be taped over the eye at night/while sleeping for the first few weeks after surgery- your own doctor will advise you on their preference. Those with office jobs can go back to work 2-3 weeks following surgery, but do be careful not to over use computer screens, and avoid air con. More strenuous occupations at least 4-6 weeks should elapse before returning to work. Those who play racquet or minor contact sports such as football should always wear eye protection during these pastimes. Major contact sports such as rugby, boxing, martial arts should not be undertaken as an eye after corneal grafting is never as strong as a normal eye. Always wear goggles when swimming and avoid getting tap water into your eyes. Uncomplicated cases can expect to visit the eye clinic as many as 7-8 times in the first year following corneal transplant surgery. Stitches are typically removed from 6 months to 2 years after the operation when glasses or contact lenses can be prescribed to optimise vision or if necessary other surgical procedures can be performed to reduce any focusing (refractive) problems with the eye. Firstly there is a big difference between rejection and actual graft failure. While great care is taken to ensure the donor eye is a suitable match, sometimes the immune cells of the body reject the new tissue. This usually happens within the first year after the operation, but can also happen years later. Roughly three quarters of all grafts survive 5 years or more. On the whole, corneal transplants for keratoconus have a very low rate of rejection. If you ever feel that there is a problem with your transplant you must seek medical advice immediately at your nearest eye department or hospital A&E. Causes of failure of corneal transplants. A failed corneal transplant generally looks cloudy and dull, making the vision very blurred. This list gives the commonest reasons why a corneal transplant may eventually fail. Most patients with a failed transplant can be offered another one, but individual circumstances will dictate what is recommended in each case. Rejection may lead to failure of the transplant, which may happen immediately or sometimes may happen sometime later. Most incidences are resolved satisfactorily. Failure of the endothelium means that the graft no longer has enough cells on its inner surface to keep it clear, and so it must be replaced. Recurrence of the original disease can happen to people whose corneal graft was done because of a genetic disease such as keratoconus, if you are particularly ‘keratoconic’ However this is really rare. Infection causing ulceration leading to scarring, may occasionally cause graft failure. Unacceptable refractive result means that the graft cannot be made to focus satisfactorily for its recipient, perhaps because of marked astigmatism. Such a graft may have to be considered as a failure, and replaced by the surgeon. Graft rejection doesn’t necessarily mean that the transplant will fail. With prompt treatment the outcome is usually good, and there is no lasting damage. If in doubt- get checked out! None of this would be possible without those amazing people who have signed a register for organ donation and agreed that their corneas (as well as other body parts) can be used in the sad event of their passing. Truly the gift of sight is an amazing thing! More than 60,000 cornea transplants have been recorded on the UK Transplant Registry since the Corneal Transplant Service (CTS) began in 1983. In 2009-10 3,100 people had their sight restored by corneas supplied through NHS Blood and Transplant (NHSBT) an increase of 12% on the previous year. There is still a major shortage of corneas in the UK. Many more people would benefit from a sight-saving transplant if more eyes were donated. Would you take an organ if you needed one? Nearly everyone would. But only 31% of us have joined the Organ Donor Register. More than 10,000 people in the UK currently need a transplant. Of these, 1000 each year – that’s three a day – will die waiting as there are not enough organs available. Wer can i get a graft transplant???? It seems that I am a bit unlucky… I’ve had three corneal transplants. The first in my left eye was successful. The second in my right eye failed (cornea remained cloudy). The third was successful. That was all in 2001 (if I remember correctly). I had two rejections in my left eye. This is quite a risk with me because I have an eye-allergy. Today, the keratoconus in my left eye reappeared and another transplant is due in the medium to long term. Seems I’m very ‘keratoconic’. My right eye’s is also showing very early signs of re-emergence of keratoconus. A cross-linking op is due in April/May this year. Strongs to everyone who also have eye-problems!!! Hello, I am very new to this website and I had a cornea graft a week ago after being diagnose with a hydrop in my right eye. I wish I can share my story as I find out that is very rare to have a transplantation with an hydrop. My question is : I can not fully open my eye since the graft and at my last appointment my optom said the graft is very successful but my eye pressure is high, is it normal? Any advice? Hydrops is quite rare yes but having a graft afterwards is very common. Grafts themselves are very common operations. It’s very early days so let the eye heal. Not being able to open it properly is quite normal. So is bring sensitive to light. The high eye pressure is something that must be sorted – normally with eye drops. The anti rejection drops can cause this so a lower dosage may be required.